clairdelalune wrote: Hi Consuelo, thank you very much for your report!!! My question is, Plushy's programs looked very empty at the Volvo Cup, aren't they ready yet or he simply skated a light version? I'm talking especially about the LP because I haven't seen any new choreography, only parts from old programs, did you see the new elements in Pinzolo? 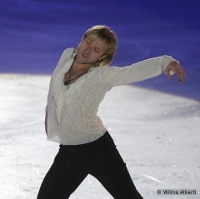 I'm sorry but in Pinzolo he worked only on SP. He worked on FP in Tartu and I was not there. Before Volvo Cup Mishin advised everyone. 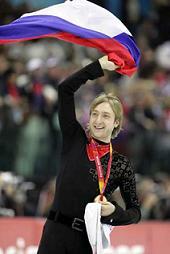 He said: programs will be in "economic / light version", we need only points to be qualified for Sochi. He took part to a B level comp in order to became friendly with ice and comps after surgery and after many months. So programs are not so important in Riga. I'm absolutely not worried about it. Apart these things, my personal opinion is also that Plushy in Riga was nervous, too pressure on him, but his shape is good, he's ok and his reaction was great!! SP in Pinzolo looked be ready (beautiful !!!! ), but if they changed something in the final version, no one knows. Yesterday Mishin announced a surprise about SP. We'll see. In FP of course you see parts of the old programs. It's a medley / a best of.. I'm happy to see the typical gesture of Nijinski and Adagio, or the Tosca's sequence. I couldn't listen, for example, Nijinsky's music without see that gesture. FP in my opionion is already a competitive version. whitebamboo wrote: Mishin said that they will use this time to work on transitions, among other things. I hope everyone will understand "the spirit" of this program. lelo wrote: Hi, finally time to came here. I want to say only one thing: we saw the original SP in Pinzolo. We wanted to cry. Music is incredible and you all listened to it. But choreo was breathless, soo emotional!! the step sequence was perfectly on time with music. The intensity grew up in the final part. We immediately fallen in love with that program. It was a masterpiece !! I think Evgeni in Riga was only a little nervous and changed something. Of course that's only my personal opinion. Hi Consuelo, thank you very much for your report!!! My question is, Plushy's programs looked very empty at the Volvo Cup, aren't they ready yet or he simply skated a light version? I'm talking especially about the LP because I haven't seen any new choreography, only parts from old programs, did you see the new elements in Pinzolo? Last edited by lala630312 on 16 Nov 2013, 16:43, edited 1 time in total. The program is not ready compared to the rules and to what other skaters present. FSU haters don't make rules, ISU does and I know this time Evgeni and Mishin are paying attention to them.